You are getting desperate troll. Run a long and assault another cop and try your sovereign citizen BS with the judge. "The Seven Deadly Sins of Donald Trump"
LUST: Has had at least one affair and multiple wives. about all the money he supposedly has. GREED: Again, he claims to be worth billions. Hillary Clinton, received 3 million more votes than he did. fired for not giving into Trump's attempts to obstruct justice. nothing to do with it, while never, ever taking the blame for any of his failures. at his Mar-a-Lago resort in Florida. Charity is voluntary. Goverrnment is force. Which one did Jesus preach, dolt? Paying taxes wont get one soul into heaven, moron. Christianity is a form of religious socialism, which is based on the teachings of Jesus of Nazareth. Many Christian believe capitalism to be idolatrous and rooted in greed, which most true Christian denominations consider a mortal sin. Christian socialists identify the cause of inequality to be the greed that they associate with capitalism. The idea you big totalitarian fascist government lovers think he is, makes my night! Don't I lie great about my opponents? 31 When the Son of Man comes in his glory, and all the angels with him, he will sit on his throne in heavenly glory. 34 Then the King will say to those on his right, ‘Come, you who are blessed by my Father; take your inheritance, the kingdom prepared for you since the creation of the world. 37 Then the righteous will answer him, ‘Lord, when did we see you hungry and feed you, or thirsty and give you something to drink? 14 You will be repaid at the resurrection of the just except for you Republican trash. You tried that BS before you pathetic cop puncher. The cop should have shot you. Listen up dumb fuk, if you are going to make statements about Christ you may want to learn what Jesus actually said. I enjoy beating the crap out of you and the other anti-Christs here with the TRUTH and the Word of Christ. 2 Consequently, whoever rebels against the authority is rebelling against what God has instituted, (like when who assaulted that cop) and those who do so will bring judgment on themselves. Are you slow? Asbergers arent you? You can be honest with me. I’m an RN. And the whole turns a blind eye. The idea you big totalitarian fascist government lovers think he is, makes my night! Jesus was not on either or/any side of politics.....pretty sure He could care less. I am no fan of Rand, but she was never so poor she could not afford medical treatment. She and hubby Frank made a ton opf money when they sold their estate near LA, and she enjoyed a lot of money from her several books and movie rights. Her foundation continues to this day subsidized by the royal;ties on her books. It is true, though that she did get cancer and applied for Medicare and was cured by it. Of course, she had payed into Medicare and Social Security just like everyone else. 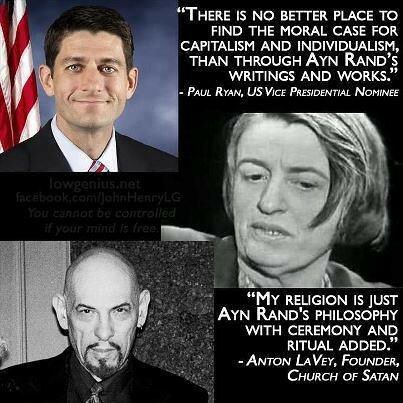 She was an atheist, and had little use for Barry Golodwater or Ronald Reagan, by the way. If what you say is correct, then she was a hypocrite and her modern day disciples who call themselves conservatives are bigger hypocrites than she was. Her contempt for Judeo/Christian values shows that she and her disciples are unAmerican and immoral.